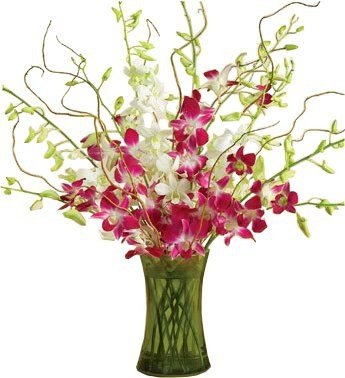 Not since Elvis left Hawaii has there been a more exotic display that has fresh Dendorbium orchids, designed with curly willow in a cool green gathering vase. Aloha! Show your love, passion, and gratitude with a dozen red roses. Accented with white waxflower, an arrangement this full of love is sure to please! 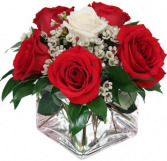 Call our shop to order or order flowers now from our website!Standard: 12 Roses. Deluxe:18 Roses. Premium: 24 Roses. A single white long stem rose rests in a bed of delicate white flowers, surrounded by five beautiful red long stem roses with added greenery. 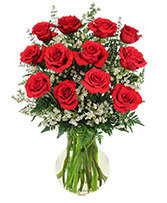 This romantic version of a traditional 1/2 dozen roses makes a perfect Valentine's gift.